Subnash Chandra with his grandchildren at their home at Vunisamaloa in Ba, yesterday. Photo: Varanisese Nasilasila Right is the late Anita Devi. Anita Devi, 55, was expected to return home after her Diwali visit to her youngest daughter. But the bus she boarded veered off the road and claimed her life. Subnash Chandra, husband of the late Ms Devi, had dropped his wife off with her last words of goodbye. “She told me that we would go to my sister’s home after she returned from my daughter’s place but that did not happen. “She was travelling to Lautoka in the Fiji Transport bus to spend Diwali with my youngest daughter,” the emotional Mr Chandra said. He only came to know about the accident when he heard news from the neighbours. Youngest daughter Pritika Mala said: “She kept delaying her trip to come home; she was supposed to come on Friday but she said Saturday and she was supposed to board the 7:30am bus but instead she came in the10:30am bus. 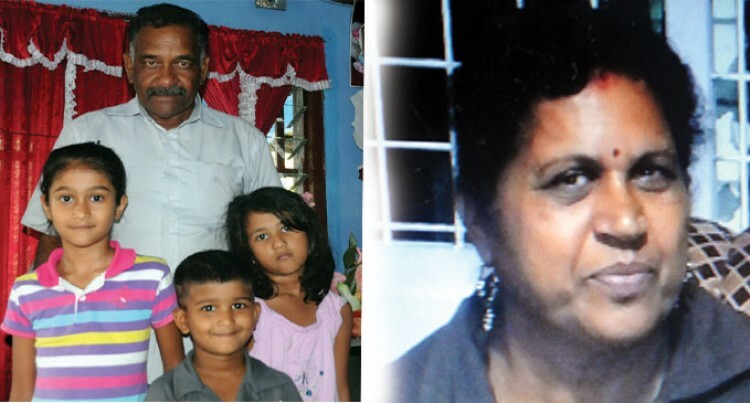 Ms Devi was one of the two victims who died in an accident along Raviravi Road, Ba at 11am last Saturday.